North Jakarta Population and Civil Registration (Dukcapil) Sub-dept. visited residents at Pelindo Flat, RW 10, Cilincing, North Jakarta to conduct e-ID recording.
" This is done to update the data and accelerate e-ID recording process in North Jakarta"
North Jakarta Dukcapil Sub-dept. 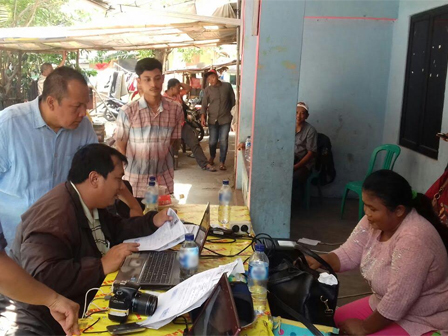 Head, Erik Polim Sinurat said e-ID recording mobile service at Pelindo Flat was done as follow up from local RT and RW administrators request. This was also to ease flat residents in order to do e-ID recording. "This is done to update the data and accelerate e-ID recording process in North Jakarta," he said, Wednesday (7/12). He informed, this activity was started from 9 A.M. to 4 P.M. 30 residents flat have been done e-ID recording and 3 of them have received electronic-ID. "Next Week, we are still providing similar service and making birth certificate in that flat," he closed.